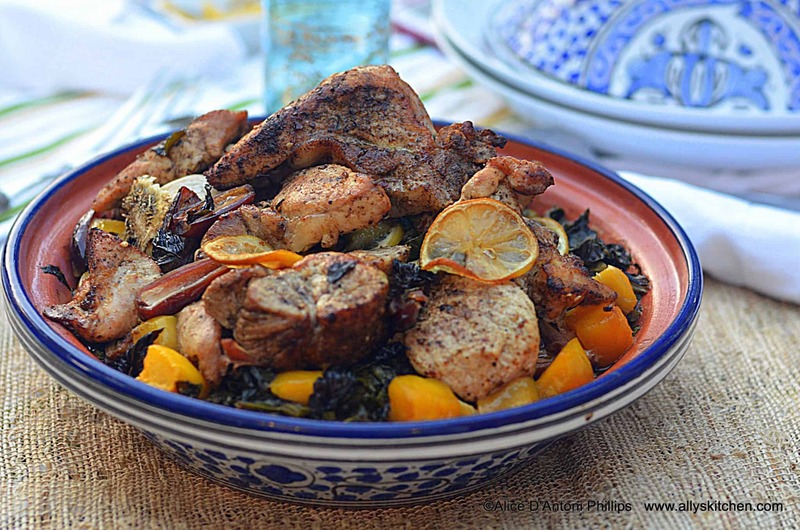 There are 3 steps to doing this ‘Tagine of Pork and Greens’~~greens, pork, tagine. 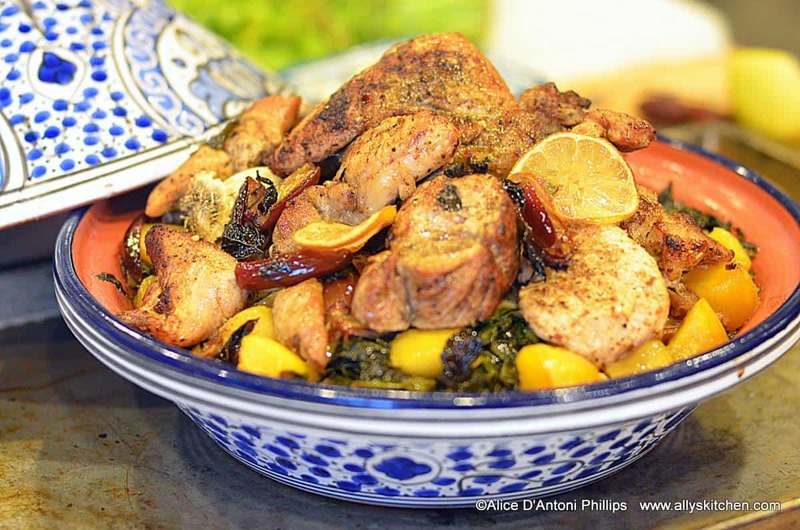 I’m laying out the recipe instructions a tad bit different giving you the ‘what to do’ right after each of the three~~so, here’s what you’ll see ‘greens’ with ingredients then instructions, then pork then tagine. Make sense? A tagine to me is like the Biblical slow cooker~~it’s been around for centuries in the Middle Eastern cuisines, and you can use a cured tagine in the oven, on the stovetop (must use a diffuser) or an open fire/grill. Of course, make sure you read up on tagines before diving in because there are some guidelines to follow when you purchase one. For instance, my guidelines from Williams & Sonoma indicate that my tagine is oven safe to 350 degrees. 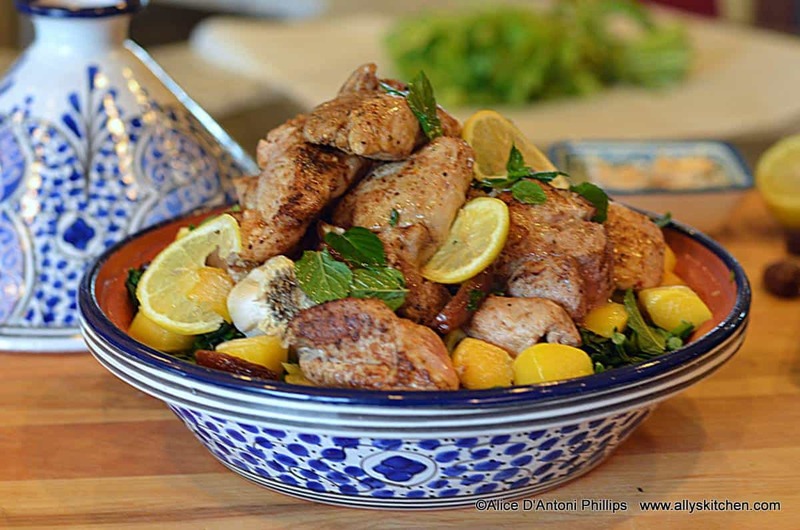 Have fun, be creative, try new things (like rice and couscous), and let the inner Boho come out in you when you serve up a fabulous dish to family and friend! In a large heavy skillet over medium heat, put olive oil and butter. Add garlic and greens and toss with tongs. Add salt, chili flakes, chicken broth and toss. Cook 5 minutes. Toss in half of the mango chunks, dates and lemons. Put this mixture in the bottom of the tagine. In a heavy large cast iron skillet over medium heat, put oil. Toss pork rib pieces in the ras el hanut, cumin and sea salt coating well. Brown the pieces in the hot skillet getting a nice golden brown all over. Remove pieces and put on top the greens. 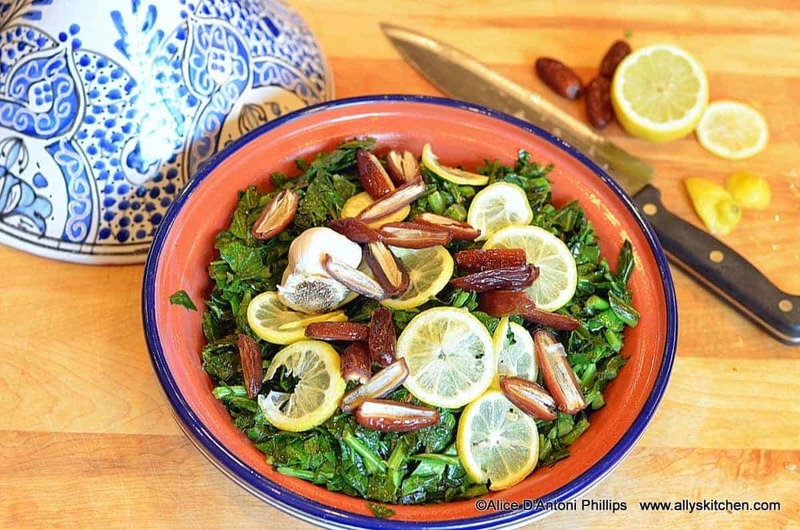 Top with and all around the remaining mango chunks, dates, lemons, mint and parsley. Drizzle over the chicken broth. Cook in the tagine in a preheated 275 degree oven for about 3 hours. (NOTE: You can cook in a heavy pot/lid or a slow cooker if you don’t have a tagine.) Remove and let cool (covered) about 15 minutes. Serve. 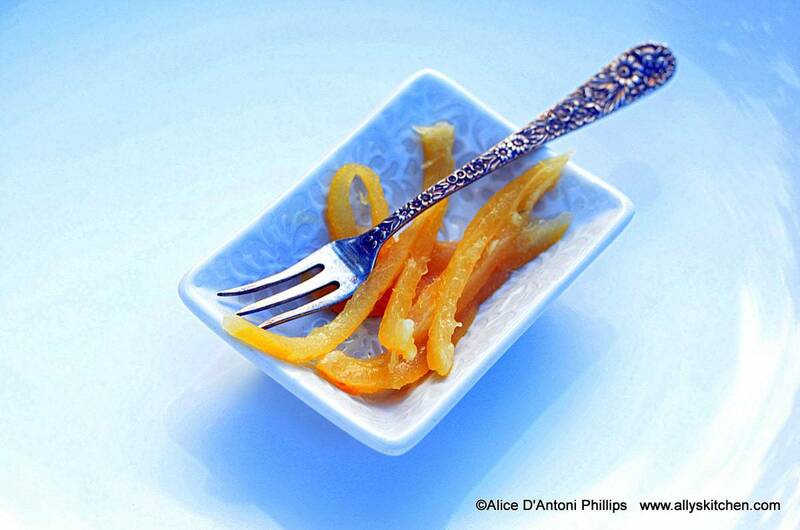 I also served with a few preserved lemon strips…of course, there’s plenty of lemon in the dish, but I just can’t get enough lemon! 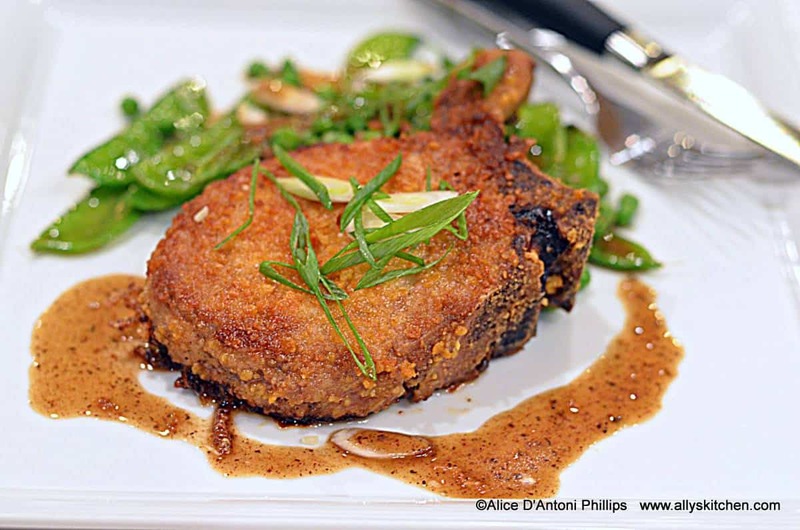 A fantastic fall dish! Being a southern gal, I love me some greens – especially if they’re brightened up with a little mango! !